In October 2012, Donnie Savella suffered an injury that eventually led to paralysis of his legs. He set a goal to get back into competitive shape by 2015. This year, he competed in the CrossFit Games Open, one year ahead of schedule. “One day I was fit, I was working out, and the next day I was in total paralysis. The reality of being in paralysis was frightening for me,” Savella says. 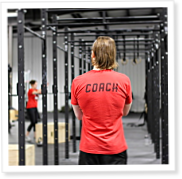 On Episode 335 of CrossFit Radio, host Justin Judkins interviewed CrossFit TNT owner Rochelle Thayer, as well as Level 1 Seminar Staff member Nicole Gordon. This episode was webcast on June 18, 2014.
there’s like this fantasy that’s going on,” he explains. Eventually, Stockton cleaned up and found CrossFit Ogden. Your thoughts can derail your performance—but only if you let them.